Lifeline Accents, influenced by global trends, encouraged us to provide you with exciting new colors and style. 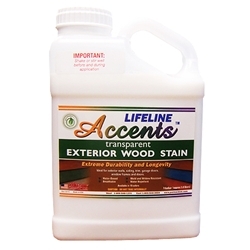 Lifeline Accents is a two-coat color finish developed to make your home look fashionable. The new stain colors create a wonderful accent for your wood trim, exterior walls, siding, fascia, millwork, timbers, furniture and other wood elements of your home. We took a page from your website photo with Bronze Ultra 7 and Evergreen for our cabin, and the log home finishes were AMAZING!!!! Wonderful contrast of colors and we used slightly less than a gallon of the Accents on our trim and doors outside. Great website with lots of information for those of us looking for ideas for our log homes! Thanks Perma-Chink Systems!! My wife purchased Lifeline Exterior Accents for Window and Door trim, she liked that Perma-Chink had so many colors to choose from. Just be careful on how much you get because it is not returnable after it has been tinted. Looks really good!